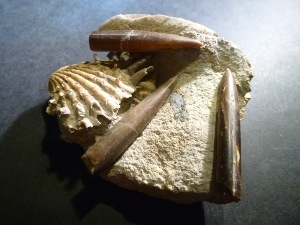 Belemnitida (or belemnites) is an extinct order of cephalopods which existed during the Mesozoic era, from the Hettangian age of the Lower Jurassic to the Maastrichtian age of the Upper Cretaceous. Superficially squid-like. They possessed ten arms of equal length studded with small inward-curving hooks used for grasping prey. 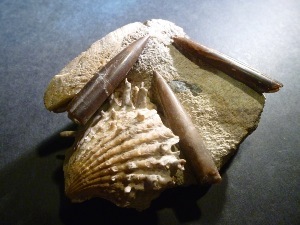 Belemnites (and other belemnoids) were distinct from modern squid by possessing hard internal skeletons. The internal skeleton was composed of the guard or rostrum (plural: rostra), a heavy solid structure at the posterior of the animals. The gastropod shell is a shell which is part of the body of a gastropod or snail, one kind of mollusc. The gastropod shell is an external skeleton or exoskeleton, which serves not only for muscle attachment, but also for protection from predators and from mechanical damage. 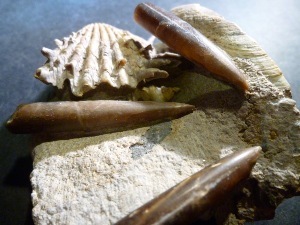 A bivalve shell is part of the body, the exoskeleton or shell, of a bivalve mollusk. In life, the shell of this class of mollusks is composed of two hinged parts or valves. Bivalves are very common saltwater, brackish water, and freshwater. Also apart of the Composite on back and though not distinguishable to tell what species but there are two Ammonites and part of a shell.